In 2005, owner and founder Matt Kaulig started LeafFilter Gutter Protection from his home’s basement. His thriving company has grown from one small office in Hudson, Ohio to become one of the largest home improvement companies in the country. 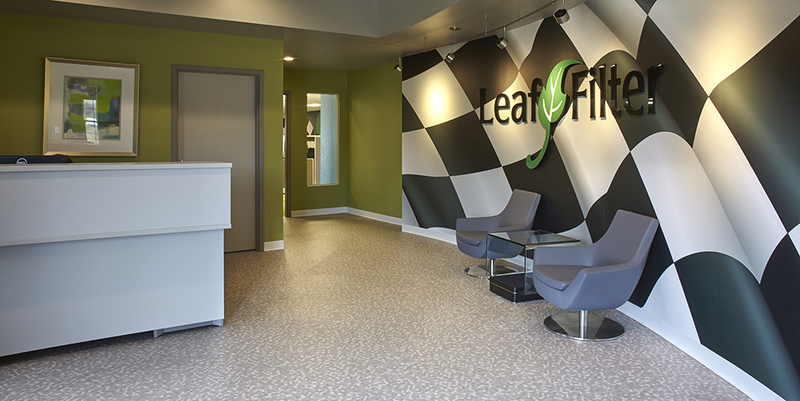 When the time came to renovate their headquarters, LeafFilter turned to the same design group that styled the space 8 years ago. This time around, changing the flooring, especially in the lobby, was a major priority. The existing black polished 18 x 18” marble couldn’t stand up to the long winters of Northeast Ohio, showing white salt streaks from foot traffic that made it look unsightly for months on end. The client wanted an abstract floor that would dramatically complement the NASCAR-themed interior motif, yet look great all year round. 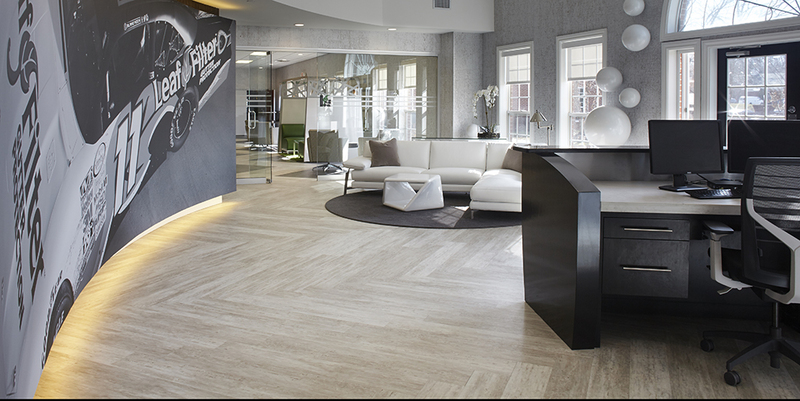 Aspecta Five LVT provided the solution with its high style coupled with superior performance. "This time around, we were looking for a light spec that wouldn’t show winter’s wear and tear. Aspecta Five Piermont in Polar White was the perfect solution: a light, modern abstract pattern with metallic hints. 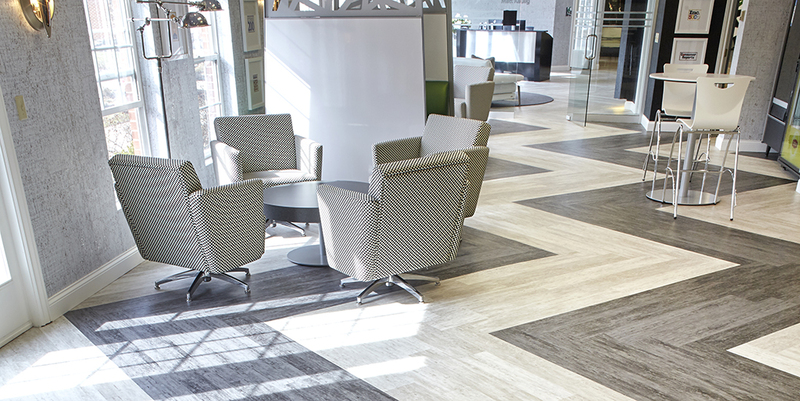 The company has an edginess in their style, so to really make a statement we added Piermont Midnight to Piermont Polar White in the common room to create a checkered flag effect in an oversized herringbone pattern. The cool zigzagging contrast visually draws you into the space. In the lobby, the white herringbone pattern with metallic accents balanced all the black and white and chrome details, as well as the signature LeafFilter green color. We turned it up a notch in the call center to make their area reflective of the employees’ high energy. The Hexi design was abstract and unique all on its own – fun and colorful. – T.J. Reinhart, Senior Designer, Assoc. IIDA, Jones Group Interiors, Inc. Style: Piermont is a brilliantly bold alternative to wood and stone. This painted wood boasts a unique layered finish by combining a pearlescent effect, abstract design and wood embossing texture - which when brought together creates the most fascinating wood grain. It's the perfect choice for office interiors as well as retail and hospitality. Comfort: Warm and comfortable underfoot. Care & Maintenance: No-wax floor is easy to clean. Planks can be easily replaced, if need be. Sustainability: Non-phthalate plasticizers. First resilient flooring to achieve NSF/ANSI 332 Platinum Certification. The Aspecta Revise program takes back jobsite scraps for reycling into other vinyl products. FloorScore® Certified for good indoor air quality. Health Product Declaration (HPD) v2.1 and a Declare Label have been published for Aspecta Five, both of which disclose the material ingredients of the product. – Chelsy Kwiatkowski, Receptionist/HR Assistant, LeafFilter North, Inc.